This series reflects the breadth of modern research in inorganic chemistry and fulfils the need for advanced texts. The series covers the whole range of inorganic and physical chemistry, solid state chemistry, coordination chemistry, main group chemistry and bioinorganic chemistry. Synthesis of Organometallic Compounds A Practical Guide Edited by Sanshiro Komiya Tokyo University of Agriculture and Technology, Japan. The purpose of this book is to serve as a practical guide to understanding the general concepts of organometallics for graduate students and scientists who are not necessarily specialists in organometallic chemistry. 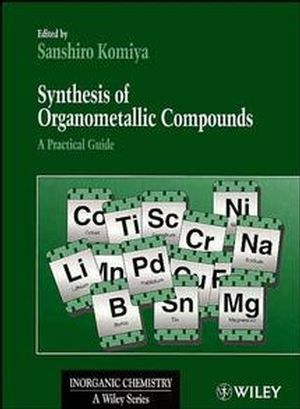 Sanshiro Komiya is the editor of Synthesis of Organometallic Compounds: A Practical Guide, published by Wiley. Fundamentals of Organometallic Compounds (S. Komiya). Manipulation of Air-sensitive Compounds (K. Komiya). Group 3 (Sc, Y, Lanthanide) Metal Compounds (K. Tatsumi). Group 4 (Ti, Zr, Hf) Metal Compounds (K. Mashima). Group 7 (Mn, Te, Re) Metal Compounds (T. Ito). Group 11 and 12 (Cu, Au, Zn) Metal Compounds (F. Ozawa). Group 13 (B, Al) Metal Compounds (N. Miyaura & K. Maruoka).